Discussion in 'General Attire & Accoutrements' started by memphislawyer, Sep 4, 2018. I am thinking a full briefcase for me is too much, but I too would like a general carry-all bag for when I run errands or will be out and about a city walking all day, such as NYC. I have backbacks and they are great for airports but I don't know that I want a backpack all day. Then again, a full carry briefcase and even in leather would be too much. I have seen some filson messenger backs on Ebay that look good, and then for the price, the LL Bean messenger looks good. There is a Mills canvas that uses like sailcloth but at $170 or so, I would spend a little more and get a Filson. Any other canvas, waxed canvas or canvas/leather bags to consider? Currently, I carry a Timbuk 2 classic messenger bag. It looks great and is made of basically indestructible ballistic nylon, but if nylon isn’t your thing, then check out Frost River. The reviews are fantastic and I have been considering picking up one of their Saganaga Travel Satchels. That looks like great stuff. If you can find a Fjallraven Vintage shoulder bag (nos) : they are well built, low profile, and light. Unfortunately I think that they stopped making them. Being the cheapskate hill-william that I am, I picked up a gen-u-ine Rothco classic canvas messenger bag and shot it with scotchguard. Cost me all of $20 maybe 10 years ago, and even now I get frequent comments, and questions from folks wanting to get one. It replaced a similar-sized Filson, that wasn't particularly waterproof, had lots of pockets that didn't fit what I needed to carry, and generally annoyed me as an over-priced piece of yuppie-wannabe-field-gear. The canvas weave could be tighter, but a few days ago in a pouring rain, it held--and kept dry--a book, a Nikon SLR and spare lens, and my lunch. It has been a field bag for most of 10 years: there's a few stains here and there, and I still need to replace the velcro (but I've meant to do that since I ordered it). It is a bit Indiana Jones-ish, but once you get past that it is a good piece of kit. Not sure how it would work out for every day use in NYC, but it has been there on a few occasions, carrying notebooks, sketch pads, and supplies. Traveling, it can double as a laptop bag (and has). Security folks like it because it only has one main pocket and a few smaller pockets, so it is easily unloaded, searched, and loaded. @Just Jim I actually have that exact same Rothco messenger bag. Mine is in khaki. I love it because it has tons of slots for writing utensils, and it's tough as nails. I also enjoy that I can fit two notebooks, a DSLR, and a couple lenses in its pockets. Not to mention a bunch of other little stuff I require on my day-to-day like my Bose headphones and a few notepads. The only downside I've found is that the strap it comes with is uncomfortable, so I replaced it with a strap from a Lands End bag, which gives me another tiny pocket for pens or something. Do you remember the exploding attache case in the Bond movie: "From Russia with Love?" It was made by a company called Swaine Adeney Brigg. They still make them, and what's more, they will make a case with any, all and even more of whatever secret device takes your whim. But with a starting price for the base model of two grand plus I think you might stick with the messenger bag. I'm a big fan of Brady Bags - https://www.bradybags.co.uk Started out as fishing bags in the 20s, but now they make a wide variety of designs. I have one with a padded compartment designed for a tablet. Three-layer canvas, ideal for the wet, keep the rain out a treat. I think you'd have to immerse it in water for it to soak through. As ever, darker colours (black, navy) don't show the dirt so quick. Don't think they accept overseas order though. If you don't mind heavier leather messenger bag, try Satchel & Page (www.satchel-page.com) I have a couple of leather bags, but the Satchel &Page mailbag is my daily commute bag. Excellent leather, quality work, low key (no cheesy logo on display). 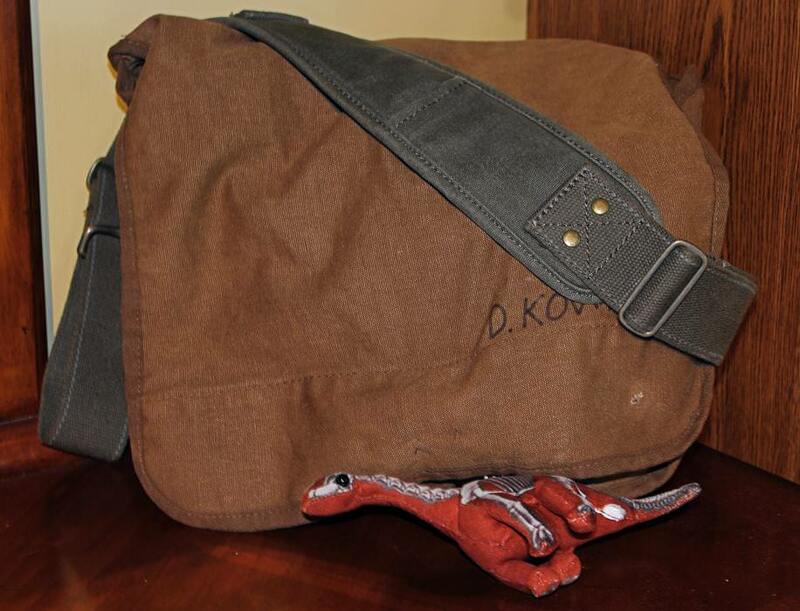 I even went on a three-week trip in South East Asia with only this mailbag as sole luggage. I could not decide so I took the coward's way out. Went on to Ebay and picked up two leather, vintage Eddie Bauer, and an LLBean messenger bags for really cheap. In great shape with the patina thrown in for free. I will give them a trial run and see if owning/using gives me more clarity on what I really need. Then maybe I will take the plunge and buy a new bag. Jacksonville, Tx, West Monroe, La. I have been using one of these, one large external pocket on the back, three larger under the flap, one zippered, then on front pocket several pen slots and one that is large enough for a small notepad, checkbook, or iPhone. My wife uses one as a purse. I tried a Saddlebag messenger bag and it was too large and heavy. I can slip and ipad pro, kindle, an extra pen, daytimer calendar to keep up with my work and schedule, and a couple of 5x8 files, basically a letter size sheet folded in half for time sheets.